I ended my summer with a two-week trip to California. I traveled alone, to attend a yoga workshop and to visit family. Flying back to Vancouver, I sat in my seat, oddly comfy and happy, reading a novel (by Laurie Colwin, if you’re curious). It was a luxury to sit, undisturbed in my thoughts. It is perhaps just mental training, to find such focus at home, where I have numerous distractions and responsibilities: more on the “to do” list. If distractions are automatically minimized during travel, why can’t they be consciously reduced during regular life? I am grappling with a similar issue regarding my home practice. 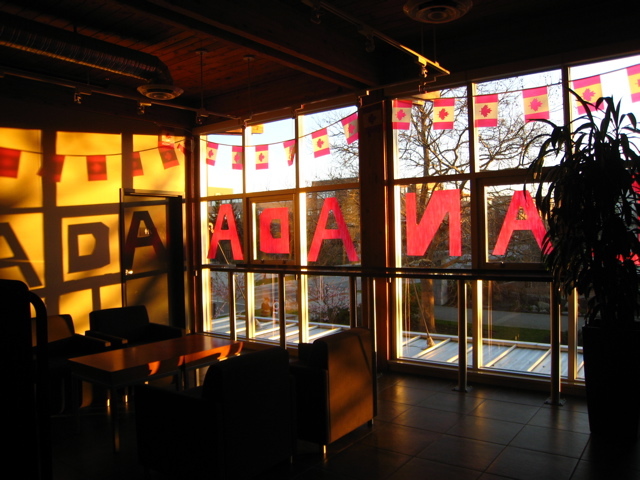 Before my move (which I discussed here), I practiced every morning at a nearby community centre, pictured here when the 2010 Winter Games came to town. It was not private, but I felt solitary. Now I practice in a cozy private room at home: it’s clean and bright, with all my props available. I simply roll out of bed, feed the animals, and enter my yoga space. Typically my boyfriend takes Momo (black Lab) out for a long jaunt while Sly (black cat) hangs out with me. My new situation is undoubtedly an improvement, and yet my practices feel disjointed nowadays. I might break a sequence to play with Sly (an indoor kitty who craves his own morning romp) or to do a household chore, and I can hear Momo return home with gusto (crunching her requisite whole carrot!). The community centre was public, but being amid strangers didn’t “count.” I was essentially alone. I could ignore them. But how can I ignore those close to me? Is it just my own jumpy mind? How can I create stillness and solitude in daily life? The trouble is… I want a home filled with “distractions.” I wouldn’t forgo my relationships (human or canine or feline), no matter how much of a loner I can be. I also relish the liminal space of the travel bubble. The addition of wi-fi on flights has not overjoyed me, because I now feel pressure to be more “productive” on flights and not just read a novel, like you point out. There’s something about being freed of too many possessions and household duties, whether on a plane or in a yoga studio or other semi-public space, that lets the mind sink into a deeper, more tranquil state of consciousness. That must be why so many spiritual leaders, from Buddha and Jesus to Gandhi and the Dalai Lama, tell us to rid ourselves of attachment to “things,” right? When I was on work+vacation (in Canada!) keeping up my yoga routine was the most obvious thing on earth. After a long night bus trip nothing was more appealing than to start the day at 4am by STRETCHING and from there my whole routine. I didn’t even mind practicing daily in a small park where early birds were walking by, especially because it was not my country and I didn’t know those people. But now, back home and with summer vacation from the yoga class I was taking, I am ‘failing’ and can’t seem to keep up my routine at home. I think we do need a group, we need the distractions, we need to feel part of something. Some days I shut everything off and just practice. Other days, my home practice includes adding loads of laundry and even returning emails between poses. I try and give myself permission to take little mini breaks — even while meditating — knowing that right now I am IN the thick of the householder life. I also find traveling an incredible, energizing break from my home to do list. Even with a toddler in tow. Coming back from Portland the other day on the plane, Neil took Lucien and I read for an hour — bliss. I think that “black” should be capitalized. Proper. A comment on grammar/dog breed, two topics that rival my interest in yoga! According to the American Kennel Club, the official breed is Labrador Retriever. The only breeds that include “Black” in the name are Black and Tan Coonhound and Black Russian Terrier. So “black Lab” is technically correct. Actually I agree that “Black Lab” also makes sense and is visually appealing on the page. But I also like the parallel “black Lab” and “black kitty” to be fair to Momo and SlySly.